Kiosks can be designed to be accessible to everyone. 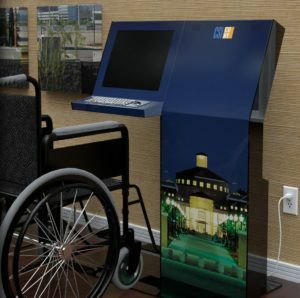 Screens and keyboards being place within reach of a wheel chair is one example, as showed in this picture by Kiosk Marketplace. Members of WeCo’s staff team attended the US Access Board Town Hall at the University of Minnesota in St. Paul, Minnesota on May 9, 2017. The meeting gave us the opportunity to learn more about the Board’s immediate priorities. Among those that touch digital accessibility were public self-service kiosks and a long-awaited Americans with Disabilities digital accessibility guidance. Public Self-Service Kiosk Accessibility Moves to the Forefront Public kiosks may include: airport check-in, financial ATM and retail self check-out kiosks, most of which are dependent upon touch screens. The US Department of Transportation started down this path in 2013 by amending its rules which require US and foreign airlines to make their kiosks more accessible over a period of time. However, pressure from advocacy groups and individuals living with disabilities, are stepping up the call to action. Public kiosks have been on the radar of other nations for sometime (Australia and Canada.) It was good to hear that this will also become a priority in the US with a renewed focus by the Access Board. Accessibility concerns for public self-service kiosks: Based upon what WeCo staff and Testers tell us, their difficulties for accessibility stem from the following. For Non-Visual Users: Not being able to see what is on a touch screen or keypad regarding where/when to press it for the desired outcome, makes public kiosks almost impossible for blind users to access. While Braille and raised print can help with the keypad, the touch screen is another challenge. For low-vision users, low color contrast and small text size can make it difficult to read what’s on the screen or keypad. For Users with Mobility Challenges: A combination of issues exist such as not being able to reach the kiosk; forward and side reach needs to be possible for people in wheel chairs and walkers. Keep in mind that devices, and people, come in many different sizes. Also, when buttons are small or sensitive, selecting items on a touch screen or keypad can be difficult when you have limited fine motor function. For Users with Hearing Challenges: Anytime sound equates access there is a problem. Kiosks that depend upon audio cues such as spoken commands and “chimes” will be difficult to access. For Users with Cognitive Challenges: If kiosk use isn’t easy to grasp there could be problems. This may occur if the text used to guide the user through a process, or to offer them choices, isn’t clear or is too wordy or confusing. New Americans with Disabilities Act (ADA) Digital Accessibility Guidance? After years of discussion, and a push by advocacy groups to have the ADA define digital accessibility prior to the departure of the Obama administration from the White House last year, we felt certain we would see a new rule released early in 2017. However, nothing seemed to be happening. 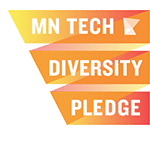 Acknowledgement of the “vague” nature of digital guidance from the ADA for websites and software. Advice that we “look to WCAG 2.0” for guidance. We promise to keep our ears to the ground and let you know when we know more. 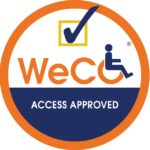 Until that time, the Accessibility Specialists at WeCo will keep focusing on Section 508, WCAG 2.0 and our own additional WeCo Standards to guide clients to real life accessibility for their clients and members of the public who also live with disabilities.